We have so many different styles of leather arm, wrist bands and wrist bracers that will compliment your outfit and keep your forearms protected. All arm bracers and wrist bracers are sold as a pair. Our leather arm armour is hand made from top quality leather. A simple leather Archers Arm Bracer designed to protect the inner forearm while shooting longbows. Worn on either right or left arm and attaches with straps and buckles. Simple leather Archers Arm Bracer designed to protect the inner forearm while shooting longbows. Made to be worn on both the right or left arm and attaches with leather thongs. Our Baudouin Leather Arm Bracers are constructed using two layers of sturdy, 9oz thick leather, which makes them a great choice for almost any period or fantasy ensemble. Laces in the back with leather ties allow for a perfect fit. Our arm bracers are crafted in heavy 7-8oz (1/8 inch) thick brown leather to provide forearm protection. The bracers lace up for a comfortable and adjustable fit. Our arm bracers are crafted in heavy 7-8oz (1/8 inch) thick black leather to provide forearm protection. The bracers lace up for a comfortable and adjustable fit. This pair of Diamond Arm Bracers are made from quality armour grade 13-15 oz leather or available in lighter 8-10 oz leather. Deluxe Arm Bracers feature a solid background color with contrasting trim and center color. Hand Made in USA from quality leather. These custom made leather arm bracers are hand dyed to suit and are Great for SCA or LARP. This pair of Deluxe Arm Bracers II are made from your choice of quality armour grade 13-15 oz leather or lighter 8-10oz LARP grade leather. Custom dyed arm bracers. The Dagger Arm Bracers are made from your choice of quality armour grade 13-15 oz leather or lighter 8-10oz LARP grade leather. Custom dyed arm bracers. Heavy, top grain leather Celtic wristbands add strength to your sword arm and provide a functional accent to many period costumes. Pewter shield and leather bands are riveted. One size, lace closure. Our Deluxe Scaled Arm Bracers have alternating 7-8 oz colored leather scales with a Celtic stamped pattern. Light leather arm bracer with celtic designs. Celtic Wrist Cuff with Triskele from brass with antiqued, hand-hammered finish. Celtic design is riveted with steel onto the cuff. The interior of the cuff is lined with suede and can be expanded or contracted to fit range of wrist and forearm sizes. Quality leather bracers, made in the U.S. Customizable with your choice of color and leather thickness. These Large Plain Arm Bracers are made from your choice of quality armour grade 13-15 oz leather or lighter 8-10oz LARP grade leather. Sturdy enough for SCA and available in lighter leather for LARP events, Faire or Theater. 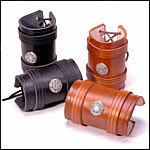 The Marauder arm bracers are made from quality leather in your choice of color combinations. Hand made in the U.S.
Our medium plain leather arm bracers are made from your choice of armor grade 13-15 oz leather or lighter 8-10oz LARP grade. Available in a variety of colors and sold as a pair. Our plain medieval arm bracers are crafted in heavy 7-8oz (1/8 inch) thick black or brown leather to provide forearm protection. The bracers lace up for a comfortable and adjustable fit. Our Gothic Fluted Arm Bracers are made from quality Armour grade 13-15 oz leather or available in lighter 8-10 oz LARP leather. Leather lace closure. The Hammered Iron Arm Bracers were crafted to look like rough worked iron armor bracers with a hammered finish! Made from quality Armour grade 13-15 oz leather. Great for SCA, LARP or Faire. Templar knights in their distinctive white mantles with red crosses were among the best fighting units of the Crusades. Our Templar arm bracers are crafted in quality white leather with a red cross. Our Leather Vambraces are made from tough, thick, heavy grade leather and are easy and comfortable to wear all day long. Good for a large variety of outfits, these vambraces are great for use with your bow. Sold as a pair. See matching Greaves. Item 200854. These beautiful leather swordsman vambraces are made from tough, thick, heavy grade leather and are easy and comfortable to wear all day long. Good for a large variety of outfits, these vambraces are great for use with your bow. Appx. 10 inches long. Pictured with matching Greaves (Sold Separately) See 200858. This pair of Fleur De Lis Arm Bracers are made from quality armor grade 13-15 oz leather or available in lighter 8-10 oz LARP leather. This pair of Fleur De Lis Arm Bracers II are made from quality armor grade 13-15 oz leather or available in lighter 8-10 oz LARP leather. Our Heavy Leather Wrist Bracer with Spikes and Snap Closure are sold as singles so if you want a pair you need to buy 2 pieces. The photo shows two singles. These leather bracers (Bazubands) with elbow protection are constructed from durable and thick 11-12 oz leather. Thick leather cord laces them into form and fits them onto the forearms. These open ended arm bands have rolled edges and infer the look of an important man, but ladies like to wear them too. Sold in pairs only. These leather bracers are hand made in the U.S. Customizable with your choice of colors, size, and leather thickness. Our scaled arm bracers are available in natural or dyed leather. Hand made in the U.S., we use your color choice and create variations of saturation for an interesting pattern. Sold as a pair. Our white diamond arm bracers are available with your choice of trim color. Hand made in the U.S.
Our suede wrist bracers are not only a nice way to accent your outfit, they are excellent for keeping puffy sleeves or ties from getting in your way. Thong closure and studded sunburst decoration, hand made in the U.S.
Our sunburst studded leather wrist bracers are made from quality leather and available in a variety of colors. Hand made in the U.S.
Our starburst wrist bracers are made from top grain leather. Wrist bracers add strength to your sword arm and are a functional accent to Medieval through Renaissance period costumes. The Teutonic Knights were a German crusading military order with white surcoats and black cross. Our Teutonic arm bracers are crafted in quality white leather with black cross. Wizards would often adorn themselves with powerful symbols like the ancient Egyptian Ankh. Made to order in our leather shop in a wide variety of color combinations. Our Studded Black Leather Wrist Band with metallic studs add the perfect accent to this medieval inspired warriors wrist band. Adjustable. 1-1/2"H Fits wrists to 8-12". Our Studded Brown Archery Leather Arm Guard / Bracer have laces at back for snug fit. 10" long. These arm braces are sold as singles so if you want a pair you need to buy 2 pieces. Our Studded Leather Wrist Band / Bracer with Buckles are made from top grain black leather with steel studs. Our Studded Black Leather Arm Bracer are warrior leather arm guards and are sold as singles so if you want a pair you need to buy 2 pieces. Laces at back for snug fit. 10" long. The photo shows two singles. Our scaled arm bracers are made from thick leather scales. The scales are riveted to a soft suede backing and closed with leather laces. Sold as a pair.